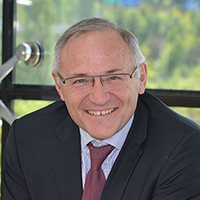 Georges Penalver is Chief Strategy Officer of STMicroelectronics, Executive Vice President Strategy, Communication, Human Resources and Quality and has held this position since August 2013. His overall responsibilities include Corporate Strategy and Development, Corporate Communication, Human Resources, Corporate Security, Product Quality Excellence, Public Affairs in France and EU. He is a member of ST’s Corporate Strategic Committee, Corporate Communication, Human Resources, Corporate Security, Product Quality Excellence, Public Affairs in France and EU. He is a member of ST’s Corporate Strategic Committee. Penalver started his career in 1980 with Sagem, where he developed the Broadband Communications Business, overseeing the launch of telecommunication products, the international industrial deployments, and the development of global sales networks. Penalver was appointed to Sagem’s Management Board in 2001 and served as Deputy CEO, pushing the mass development of mobile and Internet services. In 2005, he joined the France Telecom Orange Group as Deputy CEO for Strategy and Business Development, responsible, at the group level, for product marketing and management of services in France Telecom Orange, product creation and development for the entire group, and Orange Labs’ activities worldwide. In 2011, Penalver used his extensive experience to become a co-founder and managing partner of Cathaya Capital Fund until July 2012. Penalver was installed as a Knight of the French “Ordre National du Mérite” in 2003. Georges Penalver is a French citizen born in Meknès, Morocco, in 1956. He holds a degree from the Ecole Nationale Supérieure d’Arts et Métiers (Gold) and from the Ecole Nationale Supérieure des Télécommunications in Paris.